The Book of Forces Mod gives you the ability to create a force field around you in which you can apply different abilities to hostile mobs. In fact, this mod contains only one new item, but an astounding compound of functionalities added to the mod. The mod itself is quite simple. 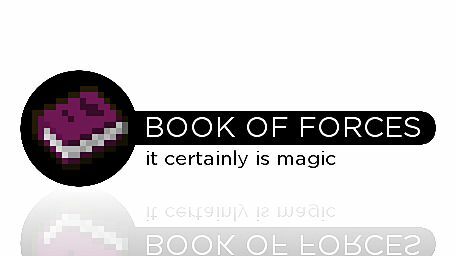 You will only need to remember one crafting recipe – the Book of Forces. It requires one Book and Quill (writable book), four diamonds and four ender eyes arranged like shown below. Once you have the Book of Forces, you virtually have everything you ever need to know. However, the fun begins when you right-click the book. As mentioned, if you right-click the book, a GUI will pop up. It basically has the same background as if you were to open a normal book, but its contents are different. You will see a small amount of pages which contain so called “abilities” which you can use within your force field. Every ability can be upgraded 10 times at the utmost. Thus you will need more and more experience levels to be able to unlock higher levels of an ability. The only difference between the specific abilities is that the “force field” requires more experience levels than the other abilities at the same level. The Book of Forces needs to lie in your inventory in order to use every ability. The force field ability is the basic ability for every other ability to work. Without that, the other abilities will remain useless. With this ability you can define the radius of the sphere around you in which every other ability is active. The radius goes from 3 to 13 blocks and requires 5 XP levels on the first and 50 XP levels on the last level. 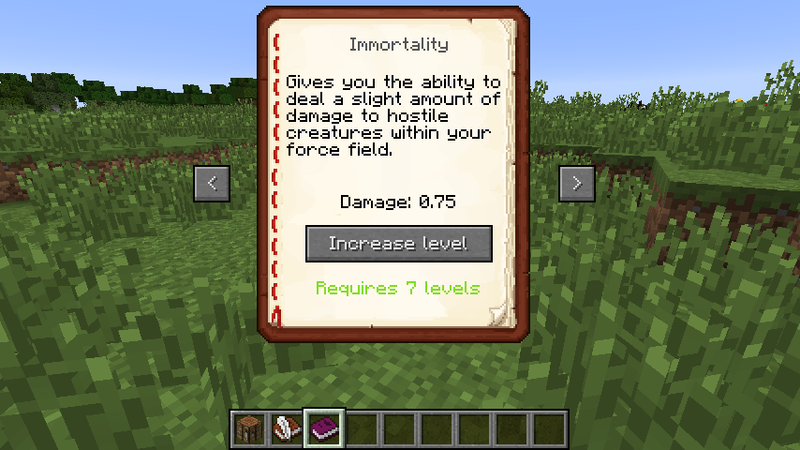 The immortality ability deals damage to hostile enemies within your force field. With every level, you will deal 0.25 (that’s a quarter of a heart) damage more. This ability requires 3 XP levels on the first and 35 XP levels on the last level. The Sorcerer’s Wraith ability applies an effect of a splash potion lying beneath the Book of Forces inside your inventory to every hostile enemy within your force field. Remember that the time in which all entities are getting affected by this potion is getting subtracted from the duration of the potion inside your inventory. The higher the level, the lower the time you need to wait until you can use the potion for another time. This ability requires 3 XP levels on the first and 35 XP levels on the last level. The Arising Winds ability slows down every hostile entity approaching you within your force field. Thus they won’t slow down if they’re not attacking you. With each level the entities get slower. This ability requires 3 XP levels on the first and 35 XP levels on the last level. Don’t try and drag the Book of Forces in your inventory when you’re on a multiplayer server. The game will crash! This mod is also available in German. Just set the language to “German” and you’re good to go. Extract the JAR out of the ZIP file when downloading this mod and place it into your “mods” folder.